We are back with a few of our favourite friends to take another look at the new release. I created a couple of projects to share with you that feature the Sassy Pants Holiday stamp set. I love the fun sentiments in this set, they aren't for everyone, but I know lots of people will enjoy them. 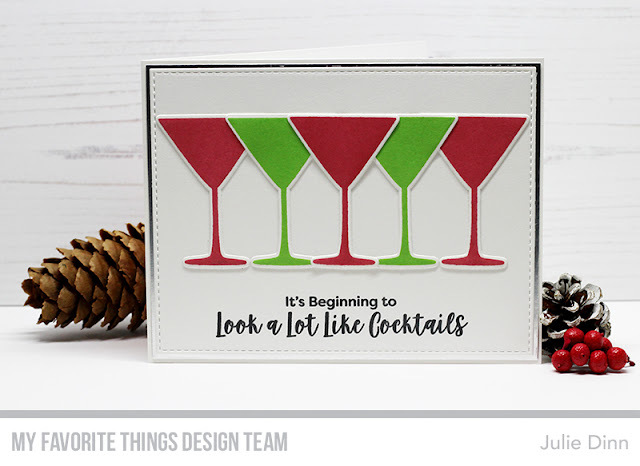 I paired a fun sentiment from Sassy Pants Holiday with five festive martini glasses from the Martini Time stamp set. I stamped the martinis in Green Room and Wild Cherry Premium Dye Ink. 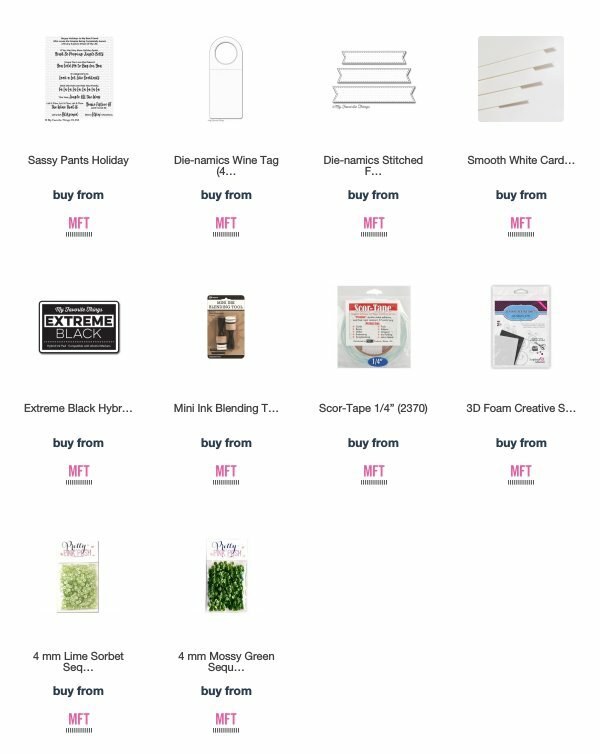 There always seems to be lots of wine flowing during the holidays so I like to make sure that I have a few extra wine tags on hand for Christmas giving. Here's a closer look at the wine tag. I created a shaker tag with the Christmas Tree Window Die-namics. I die-cut the tag in Smooth White card stock and inked it up with Broken China Oxide Ink. The ornaments on the tree were coloured with Copics. The sentiment from the Sassy Pants Holiday stamp set was the perfect finishing touch. Great idea for a wine tag! Thank you. LOVE the festive color martini glasses and wine tag! That wine shaker tag is so awesome!! Love the red and green martini glasses too! Great projects. Love this punny set. Wow! These are so cute and clever! Thank you for sharing! Lots of people like this stamp ;-). That wine tag is great! Great festive and modern card (love the sentiment, LOL), and the wine tag is simply amazing! Love that clever wine tag! Awesome saying! The card is super cool also & the design could be used year round. I love the wine tag! That is soooo fun! Fun wine tag. Love the cocktails card - must be five o'clock! The wine tag is awesome and the card is lovely and easy to mass produce for friends. Love the inspiration! Cosmopolitans and appletinis are my kind of holiday. Great card! These are both adorable. Love the shaker tag! I love how you did the shaker window super cute! What a great wine tag. If I drank wine, I would want this tag attached. I love the shaker tag done with the Christmas Tree Window Die-namics! Great combo of card and wine bottle tag. Love the wine bottle hanger. Fabulous ideas for the sassy sentiments! I love the wine tag that you made into a shaker. 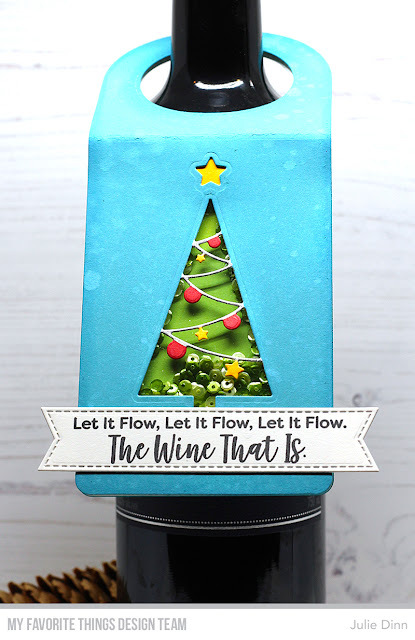 What a fun way to give a bottle of wine! I like the traditional colors with the oh-so-non-traditional sentiments. Also, a tag and a shaker on the wine? You will be houseguest of the decade. Thanks for sharing these projects with us! What a fun mix of traditional and not. That tag is really cute, too. Fun and cute card and wine tag. Both are great, but I really love the tag! Great funny card and tag!!! 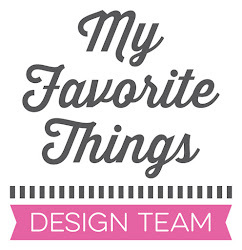 such playful and nice designs! love the shaker wine tag! thanks for the inspiration Julie! So cool! Love the red and green glasses on the card and the shaker element on the bottle tag! Love these, so perfect for adults! Such festive creations!! Love the wine tag! Wow I love your shaker wine tag! So creative! 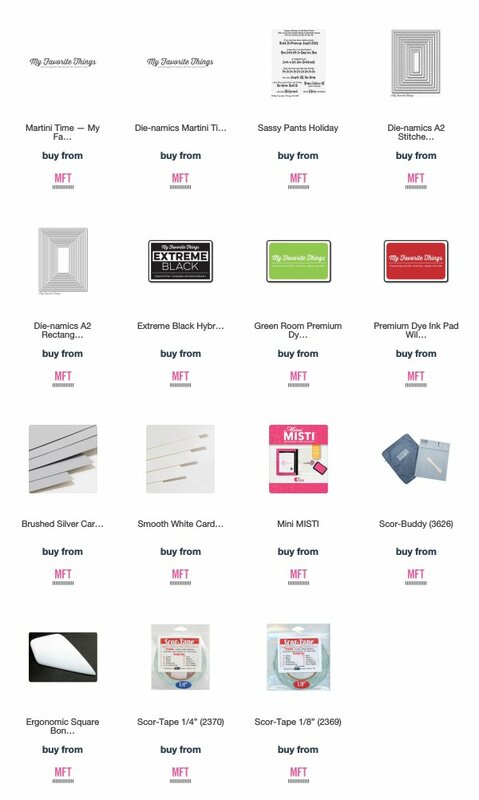 Love your martini card, and that's the best wine tag ever! 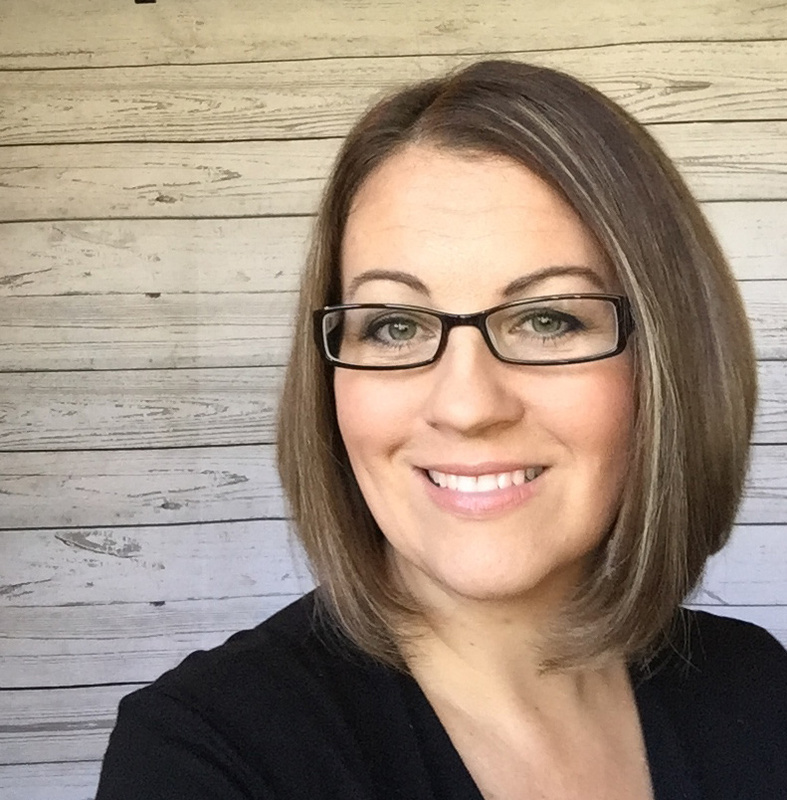 Great projects, sassy is my favorite! 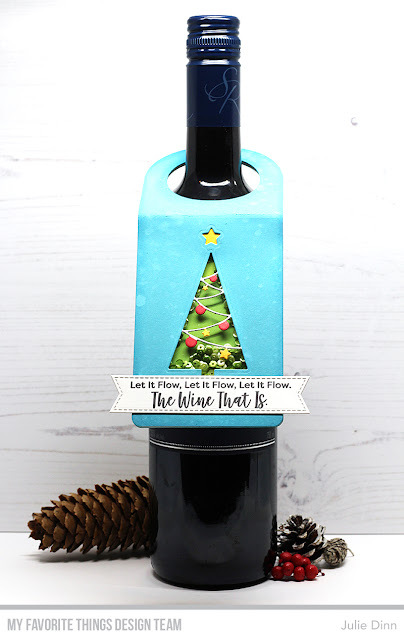 Oh what fun and festive card and wine tag! Fantastic! Love the sassiness of this set. So fun! Wonderful projects! Love the shaker tag! I love your tag and the colors on your card are really great! Cute row of cocktails and love the tree tag. luv the wine tag. I invested in it this summer!